In the urban ag world, tales of keeping chickens and bees, and even of goats mowing lawns and bluffs, are fairly common. Lesser known is the world of urban rabbit keeping. Yet for many reasons the very old tradition of raising meat rabbits is ripe for a comeback. Like chickens, rabbits can help consume leftover family food scraps, notably vegetables and a bit of fruit. And since their poop is perfect for returning to the garden, handled right, rabbit pellets make a nice compost. Folks today don’t think of rabbit meat as common American food — though traditionally it is a staple meat. High in protein and a good size for a family of four, the lean meat of the rabbit can be prepared in delightful ways, as renowned foodie chefs regularly do. 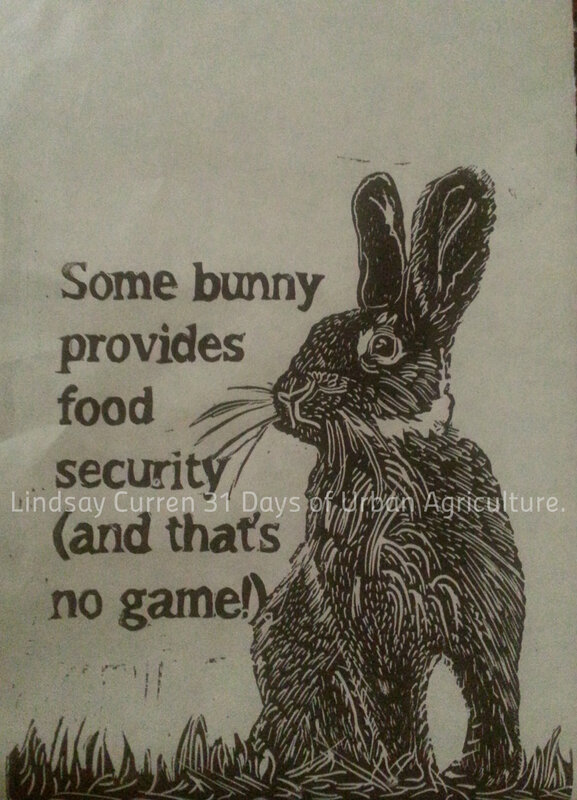 In a time of increasing food insecurity and the rising need for entrepreneurialism, rabbit keeping is an industry that solves several issues at once while creating a nearly self-sustaining system for either home consumption or rabbit meat and fur businesses. Having businesses like this in place are key to increasing food security and resilience, as this poster depicts. In this poster I intentionally made a pun on the term “somebody,” by calling the rabbit “some bunny.” I did this because first of all, rabbits are cute, and kids like them for pets. The Easter Bunny is a rabbit, not a dinner. City people may have a bit of a hard time thinking of rabbits as food. But as we bring farming closer to where people live and work we will be reminded of things we’ve edited out of our minds, our cultures, our hearts — that real creatures give their lives for us to eat. This is, of course, natural and seen throughout the animal kingdom and throughout human history and cultures. What’s less inherent today is bringing a sense of reverence to the process of what we eat. Yet indigenous, pagan, religious, tribal, and even highly civilized folks have traditionally brought that awareness to their consumption. As a religious person, I feel that reverence in my relationship to all that the Earth and God provides, which is why I choose farmed foods that have been raised by farmers I know who use processes I can respect. As we move more toward the creation of the kind of integrated food system that farmers like Joel Salatin advocate — and which can feed the world — it is my hope that reverence, dignity, and honor will be at the core of the new paradigm.